This is one of the easiest meals ever. 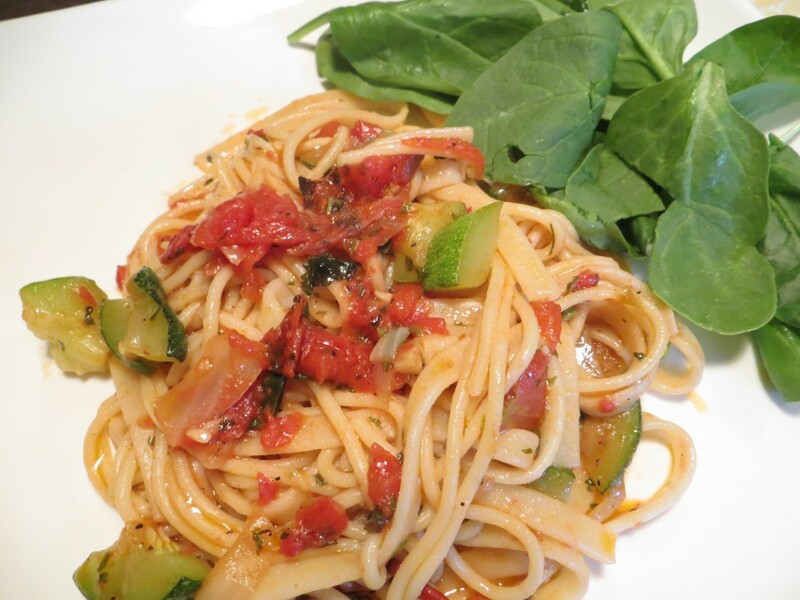 Once the pasta is cooked (takes 8-10 minutes), toss in a mixture of olive oil, fire roasted tomatoes, zucchini, garlic, and onion. Cook 8-10 ounces of dry pasta as directed on package. I used half thin spaghetti and half fettuccine. Drain and set aside. In a deep skillet combine 1/4 cup olive oil. Add one chopped zucchini, 1/2 cup chopped onion, 2 cloves finely chopped garlic. Cook until tender, about 6-7 minutes. NOTE: Fresh herbs can be used instead of dried herbs. You will need to adjust amounts accordingly. Add 1 can fire roasted tomatoes to the skillet (with juice). 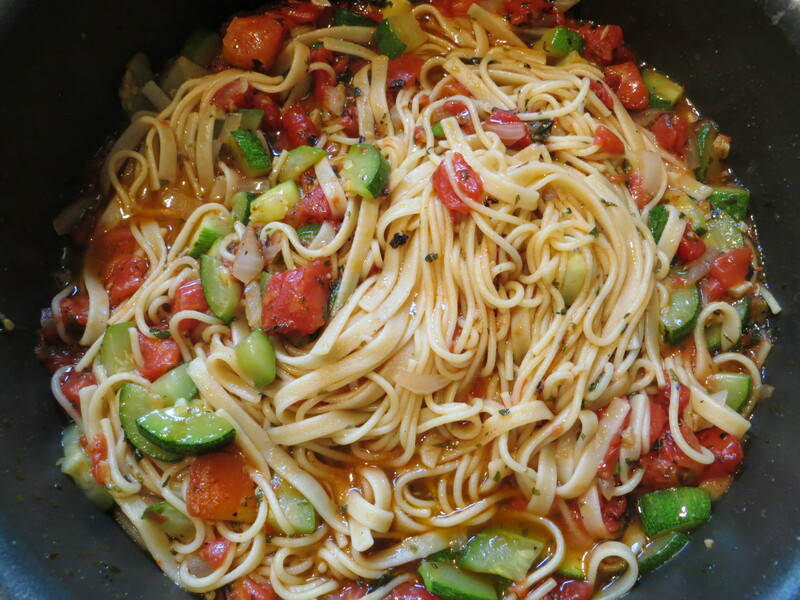 Mix well; heat through and add cooked pasta. 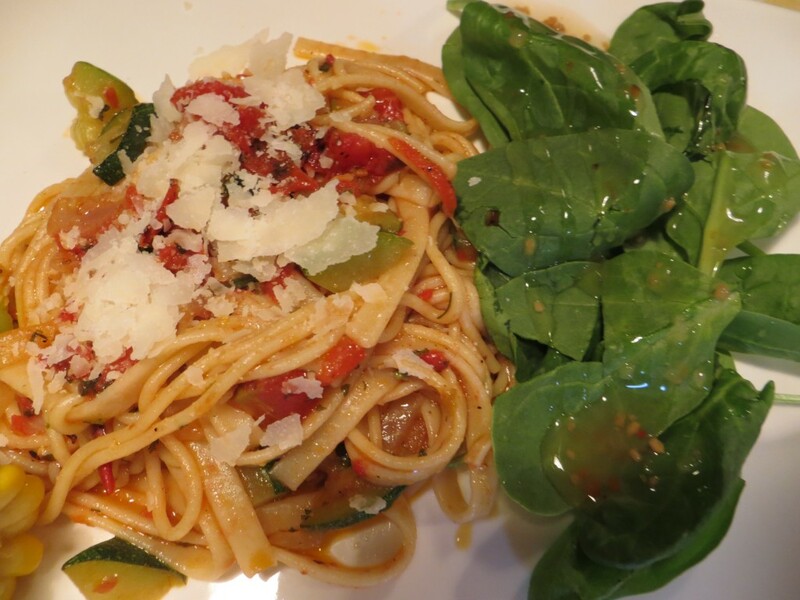 Add freshly grated Parmesan cheese with a side of fresh spinach. I used a no-fat Italian dressing on the spinach. That’s it! Easy, Peasie! You are looking at around 480 calories per serving. The recipe given will serve six. Grilled asparagus (six spears) will complete the meal and add only 30 calories. A medium slice of hard crusted baguette bread is 170 calories. I would personally stick with a serving of the pasta and asparagus. 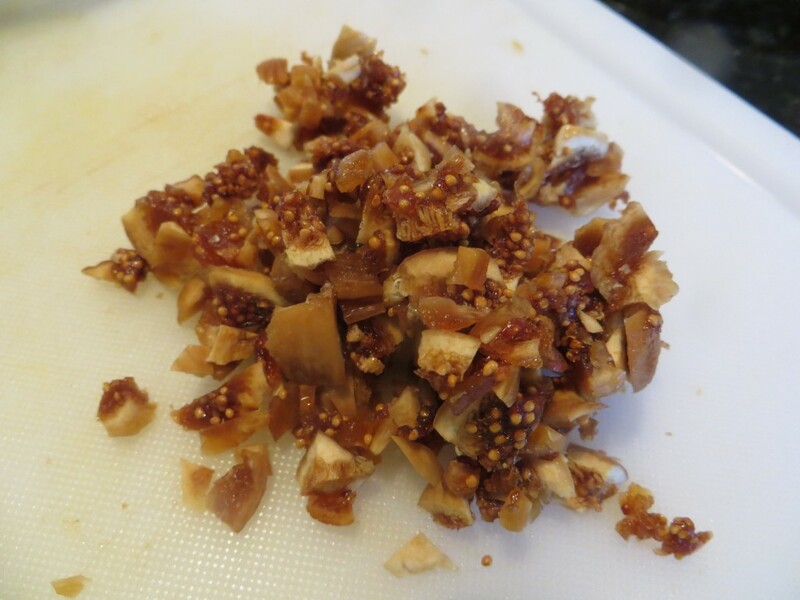 A few weeks back, I ordered some dried figs from Nuts.com. I’ve been waiting for an opportunity to use them in a recipe and today was that day. Had the Wine Guy pick up some lean center cut pork chops so I could doll them up with my special fig sauce. Prep and cook time is under 30 minutes and calories are low; just 250 calories for one chop w/sauce and a side of applesauce. I added a mixed green salad to the meal and was still under 275 calories. 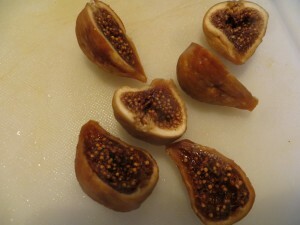 You will want to double the fig sauce because it is so yumi-licious. The want to lick your plate kind of yumminess. 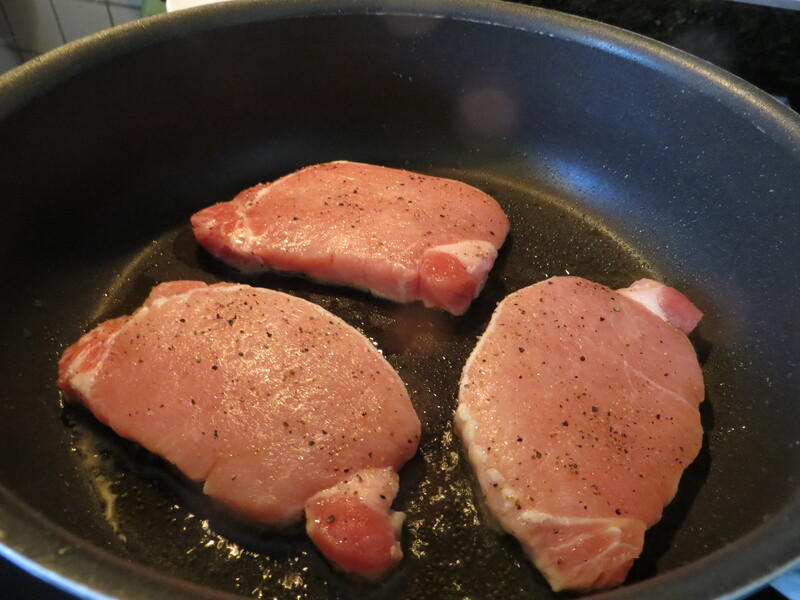 Here’s the skinny on making the pork chops and fig sauce. Heat oven to 425 degrees. Heat a large oven proof skillet over med-high heat on stove top. Once pan is heated, add the olive oil and swish around to coat bottom of skillet. 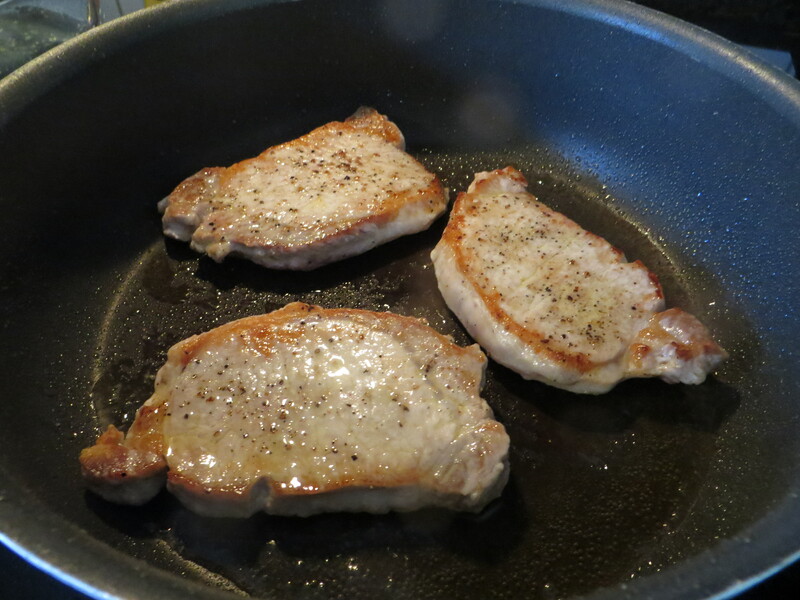 Place pork chops in pan and sear for 2 minutes until nicely browned. Flip chops and cook other side for 2 minutes. Transfer the skillet to the pre-heated oven and roast for 8-10 minutes. Internal temp should be at 145 degrees when you remove from the oven. Transfer chops from oven to a tented plate while preparing the fig sauce. Prepare sauce in same skillet used for cooking chops. Pour off excess fat, return skillet to stove top on high heat. 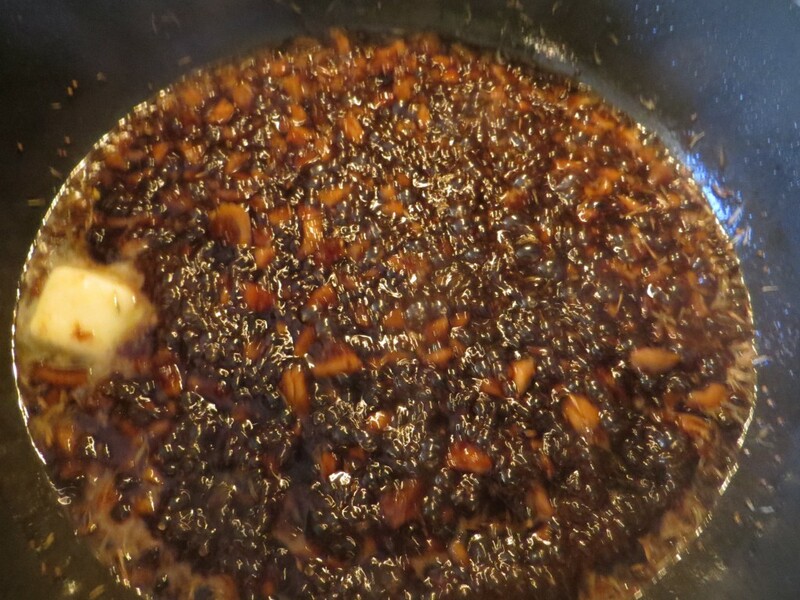 This is a reduction sauce and the high heat is needed to reduce down the liquids. Add broth and vinegar to skillet, stir with wooden spoon dislodging any brown pieces left in the bottom of the skillet. Reduce over heat to 1/2 cup. This will take about 5 minutes on high heat. Stir in figs, honey and thyme and cook sauce until reduced to 1/4 cup (now you understand why I suggest doubling the sauce). This should take 1-2 minutes. Add the butter to sauce and stir until completely melted. Add salt and pepper to taste. 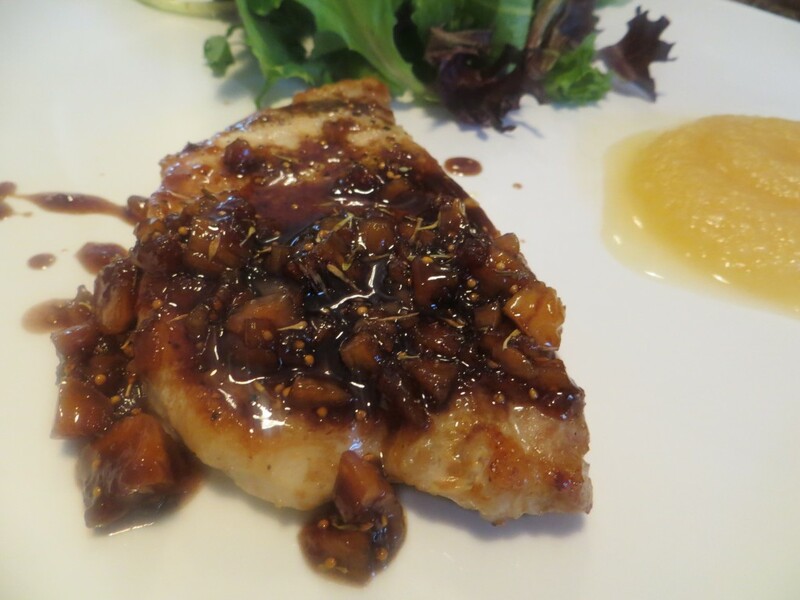 A Zinfandel or Shiraz wine would complement this dish well due to the sweet elements in the sauce. Drizzle the fig sauce over the chops and serve. I served with applesauce, but there are plenty of other side dishes to consider. Roasted root vegetables are both easy and a healthy choice they include parsnips, carrots, rutabagas and turnips (root only). Wild rice, Brussels sprouts, fried apples, sweet potatoes or mac & cheese are other options.